I guess that this wish slightly differs from #887510. I am for the moment limited to HomeBank 4.5.5 on Ubuntu 14.04, hope my wish is not outdated. What I miss most from Quicken98 is the "table view" for budget setup. >category: sum of sub-categories amount, and there is a mandatory sub-category labelled "category - others"
This is a powerful tool to maintain an equilibrated budget. I took note of the answer given to #590387 : import/export budget as CSV file. It is a good workaround. This would deserve an entry in "tips&tricks" chapter of documentation. I took last week some time to hack homebank to create such a view. It looks good for me (see screenshot attached), but I'm not a lot familiar with C and Gtk+, so reviews are welcome ! For the moment, I've decided to add this view as a new report named "Budget balance". Maybe in the future, we'll want to use this view to manage the bugdet too. That could be feasible (the Gtk tool kit is cleary able, we just have to add more code to manage edition), but the current UI to manage budget seems to be simpler. I didn't implemented "sums sub-category in parent category", because the user can set budget on parent categories too. Note that I had to create a new preference in HomeBank to keep size and position of this new report. I think the wish was for input, and not for report. Ok, while I was making this proof of concept, I've thought about such a screen with editing capability. I've not currently implemented editing functions, but that's clearly feasible with the Gtk tooling, I just need to take a little more time to do the bridge between Category class and the GtkTreeView/Model. 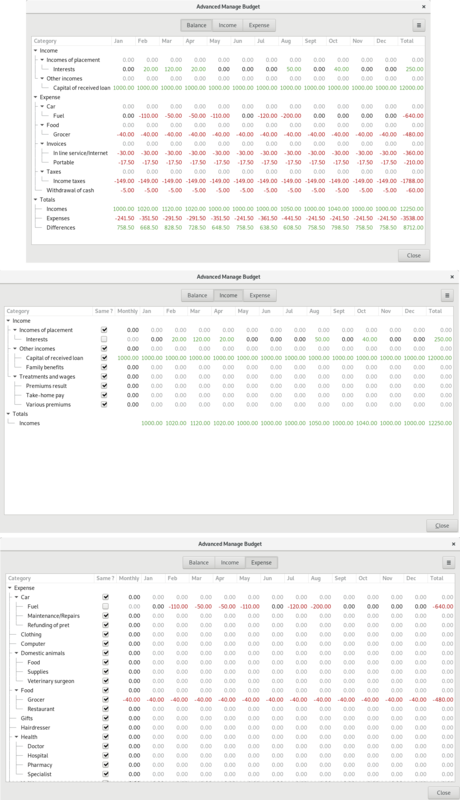 Does a budget editor using this table view as a base has some interest for you ? 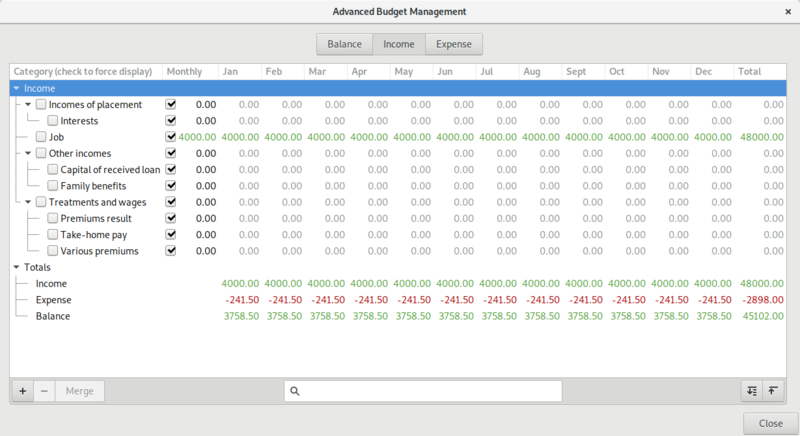 To do that, I just need to add two columns one to decide if the amount budgeted is fixed for all month and one to set input in the fixed mode. Although the GtkTreeView will be really big horizontally, because of the 16 columns and vertically too, because I'll have to show all categories and not just the ones with a budget setted. Let me know if you want I continue to work on this, thanks ! > screen with editing capability. > do the bridge between Category class and the GtkTreeView/Model. > budgeted is fixed for all month and one to set input in the fixed mode. > and not just the ones with a budget setted. > Let me know if you want I continue to work on this, thanks ! Last weekend I took some time to do a few work on this feature. - "Balance": contains categories (income and expense) that have a budget. This view will be read only to reduce the number of columns (it doesn't have columns "Same ?" 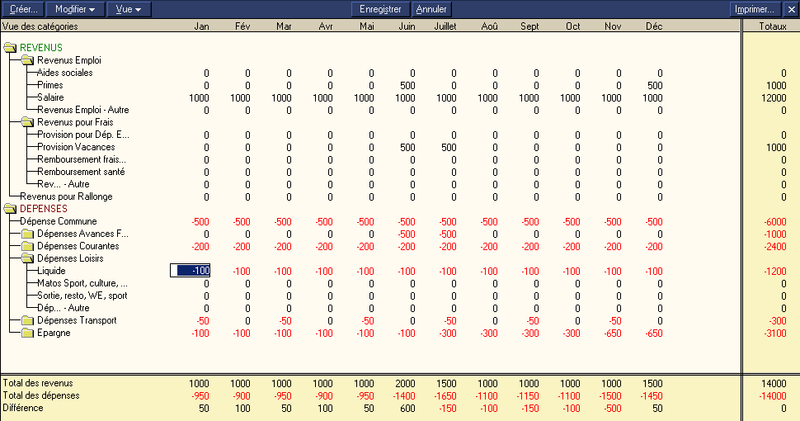 and "Monthly") and shows only categories which are forced to show or which have a budget set. Currently, all this work is still under the "report" menu, because I need your opinion about how to name this new budget manager and if it should replace the current budget manager. Personally, I think we should keep both budget manager and we could call this one "advanced budget manager". Although, I'm aware that it will double work of support and bug surface. On next days, I'll implement the edition of cells to allow user to set values. Since I've written my comment above, I've thought it will be better to have the 3 views editable (and so every one with all columns). The advantage of the balance view is to have directly the balance between incomes and expenses without having too many useless categories. The advantage of the two other is to show every categories, even the one which are not currently used. Maybe, I should add for these two views a new column to show/edit the state of the setting "Force display (in balance)". I had time to finish implementation of this new feature. 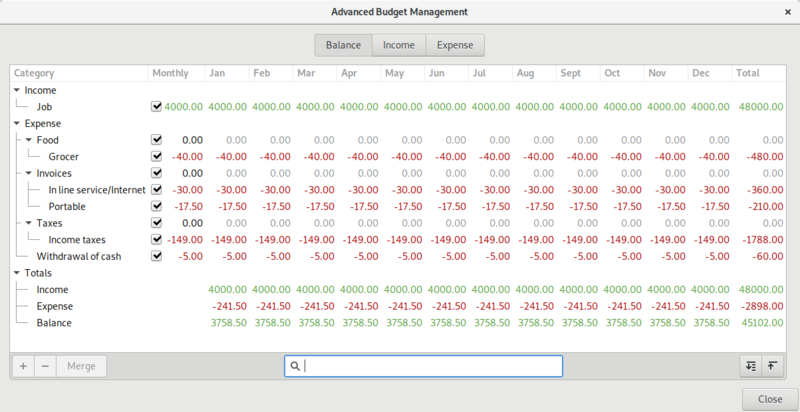 Currently, I've added a new dialog "Advanced Budget Manager" below the "Manage" menu. The dialog contains just the 3 modes proposed above and every mode is editable. I'll propose to merge my bazaar branch to resolve this bug. I've just seen the patch isn't complete: I forgot to increase a "using" counter for each categories. I'll check later how I should do this. I will review all of this for next 5.3 for sure. Ok, I've just added a new merge proposal for this bug which adds category management feature inside the same screen. I'll add some screenshots to this bug report so you can see the progress.